In just a few weeks, school will start again in most schools. For teachers gearing up for the new school year, here are some instructive articles that may help get new ideas flowing -- everything from using free online games, free digital media tools, cell phones, Pinterest and Learnist, and creating your own textbooks. 14 FREE AND SIMPLE DIGITAL TOOLS. With so many free (or inexpensive) useful tech tools out there, editing video, audio, or photos doesn’t have to cost a fortune – or leave you with a headache. If your digital media needs are simple, your tools can be simple, too. We rounded up the best ones for your consideration. CAN LEARNING REALLY BE FUN AND GAMES? For those wondering what a game-based classroom looks like in a traditional school, take a peek into Ananth Pai’s third-grade class in Parkview/Center Point Elementary school in Maplewood, Minnesota. Using his own money and grants that he applied for, Pai has managed to round up seven laptops, two desktops 11 Nintendo DS’s, 18 games for math, reading, vocabulary, geography, and 21 digital voice recorders. BUILDING GOOD SEARCH SKILLS: WHAT STUDENTS AND TEACHERS NEED TO KNOW. The Internet has made researching subjects deceptively effortless for students — or so it may seem to them at first. Truth is, students who haven’t been taught the skills to conduct good research will invariably come up short. The following are the hallmarks of a good online search education. HOW EDUCATORS ARE USING LEARNIST. Learnist, as many have already pointed out, works much like Pinterest — a way to catalog online resources on a topic and share them with the user’s social network. And like Pinterest, it looks like a digital bulletin board with pictures and messages, and connects with Facebook accounts. In fact, the site’s “learning boards” look quite a bit like Facebook’s timeline feature, and Facebook membership is required to use Learnist at this point. TRANSFORM MINECRAFT INTO CLASSROOM LESSONS. Teachers like to use Minecraft because it’s a “sandbox” game — it provides players nearly limitless freedom to build within it. As a player’s skill develops, the game’s complexity increases ad infinitum. In multi-player levels, players collaborate on building complex structures, use programming features to build contraptions, games, or compose music. Meanwhile, beginning players use their problem solving skills to scavenge for materials. They learn to mine stone for building, and coal for making fire. HOW TEACHERS MAKE CELL PHONES WORK IN CLASS. In the most ideal class settings, mobile devices disappear into the background, like markers and whiteboards, pencil and paper – not because they’re not being used, but because they’re simply tools, a means to an end. The “end” can be any number of things: to gauge student understanding of a concept, to capture notes and ideas to be used and studied later, to calculate, to communicate, to express ideas. 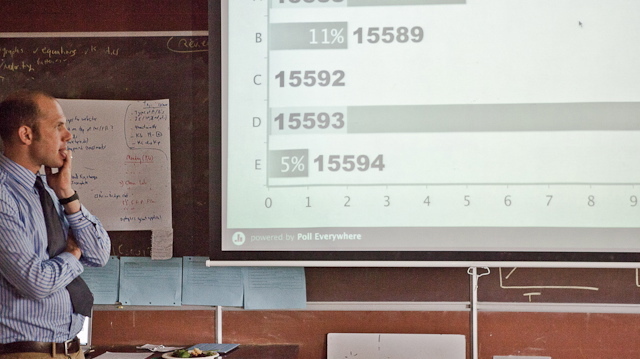 PICTURES, POLLS & VIDEOS: HOW TO USE MOBILE PHONES FOR LEARNING. Kids are using Instagram and Twitter in their daily lives outside of school, so why not let them use it for class studies too? This is just one example of many featured in this second episode of Infinite Thinking Machine, a Web TV show for teachers produced by Computer Using Educators (CUE), which shows how to use students’ mobile devices in school. Examples like quick class polling to gauge student understanding using Poll Everywhere, Text the Mob and Wiffitti; creating instructional videos on sites like Educreations. HOW EDUCATORS ARE USING PINTEREST FOR CURATION. The social network launched two years ago, but in recent months has drawn red-hot excitement for its unique visual, topic-based curation approach. While its 10 million users, especially women, are drawn to it almost obsessively, brands, media firms and news organizations have also planted flags on the network. Now journalism school faculty are increasingly in on the act. HOW TO CREATE YOUR OWN TEXTBOOK. As the open education movement continues to grow and become an even more rich trove of resources, teachers can use the content to make their own interactive textbooks. It might seem daunting, but the availability of quality materials online and the power of tapping into personal learning networks should make it easier. Here's how to create a digital textbook and strategies for involving the students in its development in three steps. SEVEN FUN (AND CHEAP CLASS PROJECTS TO TRY WITH VIDEO. For educators interested in incorporating video into classroom lessons, here are seven projects to dive into.